You keep a close watch on sales, daily production numbers, and complete a profit & loss statement at the end of each month. That may be enough to satisfy the government and the stockholders, and provide enough information to keep work flowing, but the standard reports that most plastics companies rely on show only the tip of the iceberg. There is much more valuable information hidden in the process (under the surface), in measurements of production, material usage, and hours that can help you improve performance, reduce costs, and throughput from your plastics manufacturing plant. 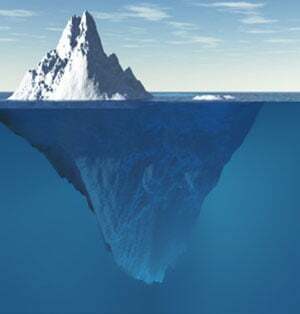 If you are only seeing the tip of the information iceberg, you may be missing a lot. Ignoring this hidden information poses a threat to the health of your business. Overall management of production and inventory is really the sum of the management of individual resources within the business – individual machines, people, materials, and goods. And just as the chain is only as strong as its weakest link, challenged or underperforming resources can negatively affect the performance of the entire organization. It is important, therefore, to measure and manage each resource as closely as possible in order to detect any variance from expectations and be able to take corrective action before productivity and throughput are affected. In today’s digital factory, it is easier than ever to achieve that goal. The best modern ERP/MES systems are built to continuously monitor key measures of machine rate, output, efficiency, quality (reject rates), utilization and other factors and alert operators and managers when conditions or accomplishments vary from expectations. Arguably the most important internal measurement to watch is Machine Efficiency: tracking of cycle time – the interval between successive pieces produced – or similarly the amount produced per hour in either units or pounds. Since actual production time is a major factor in product cost, a variance from the assumed or optimum run rate can make a big difference in cost-of-goods and profit. But running faster than “normal” may not always be good if the result is lower yield or a higher scrap rate. So tracking rejects is also very important. And reject tracking should be as real-time as possible. The sooner a quality problem is detected, the sooner corrections can be made and fewer bad parts will be made. Even though raw material cost is typically a relatively small component of cost-of-goods, availability is critical – running out of material before the required quantity is produced can be disastrous. Acquisition and maintenance of raw material are tied to forecast or backlog, and usage rate. If the usage rate is incorrect, there is risk of material shortage. In addition, an inaccurate usage assumption in the recipe or bill-of-material can lead to incorrect pricing and misleading margin assumptions. Monitoring actual material usage validates bill-of-material assumptions and provides insight into actual usage including start-up losses and “normal” scrap – all information that can be used to refine costing and material management. Monitoring of usage in real-time may also provide early warning of process problems that can lead to rejects or operational problems. It may sound complicated to continually watch multiple factors at multiple resources, but in fact, continuous measurement and reporting are much simpler it sounds. Technology gathers the detailed information and does the initial assessment by matching actual measurements against expectations and past experience. Only deviations or unexpected results are immediately communicated to responsible individuals for follow-up or further investigation. Accumulated information is always available, of course, for study and performance improvement efforts. Contrast that with the need to respond to a quality problem, production delay or cost overrun after the fact – without any hint as to the source and location of the problem. The Titanic had its unfortunate encounter with the hidden underside of the iceberg at a time when radar, sonar and modern navigation and communications did not yet exist. A sinking caused by an iceberg encounter is unimaginable today simply due to the technology available and in use in all ocean-going vessels. Plastics manufacturers have access to the equivalent of sonar and radar for monitoring activities and resources in the plant that can reveal the existence and even the emerging possibility of hidden perils like an unexpected variance in run rate, change in scrap or yield, or unusual material usage. Smart management will use these signals to proactively fine tune performance to reduce scrap, lower costs, improve on-time completion, and preserve margin.